Having a party? 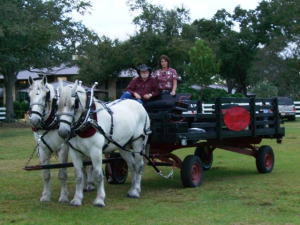 Why not entertain your guests with a carriage or wagon ride? We are available for private parties, Quinceaneras, cook-outs, proms, anniversaries, Christmas, Thanksgiving, family get-togethers, or when you want to ‘pop’ that big question to your loved one. If you would like to check us out, come to the town of Celebration, Fl. We usually have a carriage there on Friday and Saturday nights. Be sure to call before you come as the weather or city events may prohibit us from working. We can decorate the carriage or wagon in your theme or colors. From ‘Hoe-downs’ to Formal, we can supply your needs. We operate day or night. All vehicles have lights for evening operation. The carriages have tops that can be put up for that sunny day or intimate evening. The vehicles are pulled by one of our beautiful horses. We are completely mobile, so we come to you anywhere in Central Florida and surrounding areas. A Cinderella Carriage now available as well for your special occasions or parties. 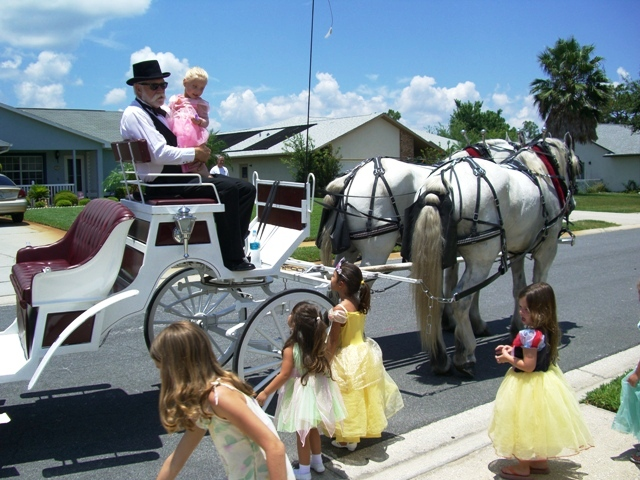 Why not surprise your family or friends with a carriage or wagon ride?